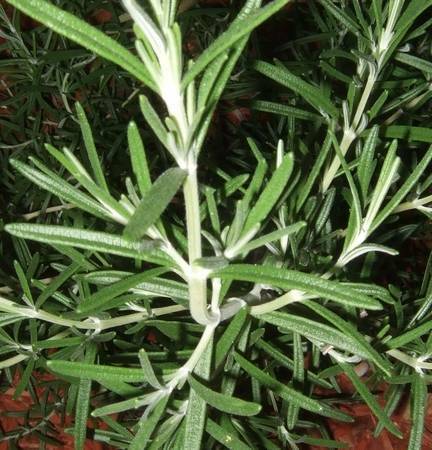 Rosemary is often an ingredient in commercial shampoos and conditioners, facial toners and skin care lotions. With the following recipes, however, you can make your own organic rosemary formulations for a fraction of the cost. Better yet, you will know exactly what other ingredients are used and you can adjust the formulations to suit your own body chemistry. See Growing and Using Rosemary for cultivation tips and how to grow rosemary outside and indoors, in containers. 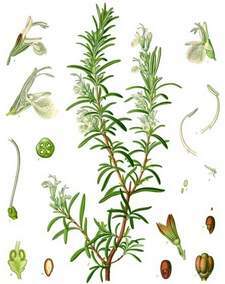 This article also discusses the traditional and modern therapeutic uses for rosemary, and has a good basic recipe for rosemary tea or tisane. Natural rosemary hair care recipes for hair oil, softening rinse, scalp restorative and rosemary quick shine and anti-static. Refreshing skin-toning recipes to treat your face, with formulas for Rosemary Facial Steam Bath, facial toner, facial mask or scrub, rosemary acne remedy. Soothe itchy or sunburned skin with a simple rosemary vinegar recipe. Preparation: Heat 4 cups of apple cider vinegar in a saucepan until the vinegar begins to simmer. Remove from the heat and add half a cup of fresh rosemary leaves. Allow to cool and set aside for a few hours. Strain and store in a pretty jar or bottle. Will keep for about a year without refrigeration. To Use: Add one cup to a warm bath and soak for at least 20 minutes. Put a handful of rosemary in the centre of a square of layered cheesecloth, muslin or linen. Draw the fabric up around the herbs, and tie closed with a string long enough to suspend from the bath taps. Hang under the faucet while you add water to the bath. Make a rosemary-scented after-bath splash by adding rosemary to a glass bottle and covering with grain alcohol or vodka. Let sit for a few weeks, then filter out the leaves. Measure the liquid and add double that amount of water. Store in a glass jar or spritz bottle for use after bathing. This herbal douche is slightly astrigent yet gentle and refreshing. Bring eight cups of water (preferably non-clorinated) to a boil in a medium saucepan. Remove from heat and add 4 tablespoons rosemary leaves. Cover and allow to infuse for two hours, stirring once or twice. Strain out the leaves and proceed as you usually would when douching. Infuse 1 tablespoon of rosemary in 5 cups of water; double these amounts, if desired. Let stand, then strain while the water is still warm and add it to a suitable bowl. Soak feet in the fragrant water for 15 to 20 minutes. If desired, follow with a pedicure. Add one teaspoon each of dried rosemary and mint to a nonmetal teapot; pour two cups of boiling water over the herbs and let steep for about half an hour. Strain and pour into a bottle. Use as a daily mouthwash for natural fresh breath. Caution: As with any herb, rosemary can cause adverse reactions in some people. Topical use of rosemary can cause allergic reactions, and rosemary should be avoided by those prone to seizures, people with heart conditions or high blood pressure, and women who are pregnant or breastfeeding. Consult a doctor if you are not sure if rosemary is safe for you to use. AllFreeCrafts makes no claim or warranty as to the effectiveness or safety of these organic recipes; use at your risk.